Looking to buy AMI Travel Insurance? Our guide covers its stand out points, pros, cons and limitations with AMI's 'International' policy. Policies cost at least $400+ for a couple for 4 weeks in Europe; our pricing review compares AMI Travel Insurance to other popular products offered by AA, 1Cover and Southern Cross. We update our example pricing every 90 days, with an extensive number of policies reviewed in our travel insurance comparison guide. Travel insurance is a significant expense on any holiday, but it need not be. There are many companies selling travel insurance, but finding out 'which one is best' is not easy. 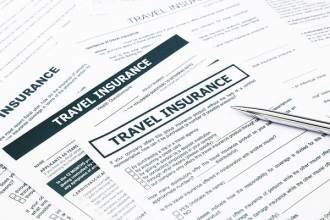 What should travel insurance cover? Medical expenses - should you get sick or have an accident, all of your medical costs will be taken care of. Be aware - many travel insurance policies limit almost EVERYTHING. For example, the maximum cover of individual items is usually $1,500 to $3,000, unless you specify extra cover and pay additional costs. This means that if you lose a $5,000 watch or $3,000 handbag, the most you will be able to claim is the limit of the policy, unless you insure the items separately. If you're going overseas, basic risks must be covered to prevent serious financial problems if and when disaster strikes. For example, medical costs can run up into thousands of dollars for simple treatments overseas. Theft, or damage to belongings can be expensive and ruin a trip, while cancellation and disruption to your travel plans can be costly. By insuring for these risks with travel insurance, you are 100% protected if and when a problem arises. If you don't have travel insurance, you are taking a serious risk. The media is full of stories about uninsured travellers stuck in hospitals while bills run up into thousands of dollars. Worse than that, many hospitals around the world will not treat you unless there is payment upfront. Is expensive travel insurance better than cheaper travel insurance? The best travel insurance is the one with the best cover and minimum exclusions. A low excess (the cost of making a claim) is also an advantage. What each insurer charges is not a reflection of the benefits offered - comparing travel insurance is essential to avoid being ripped off. To simplify the policies, we present the most important details below. 1. What does the policy cover? 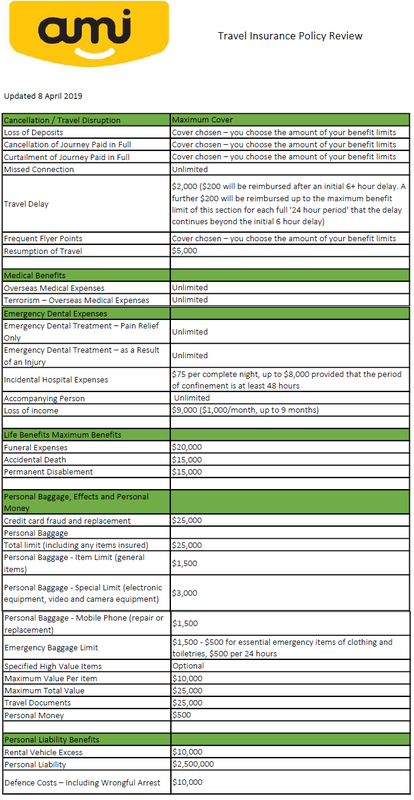 In the table below, we outline the benefits and limits of AMI Travel Insurance's Comprehensive plan - you can also download it as a PDF here. The sudden return to New Zealand during travel - the costs of returning to New Zealand due to the death of a policyholder's relative won't be covered if the death was caused by a "pre-existing medical condition or any complications directly attributable to those conditions. If you have a sick relative and go on holiday only to get a call to return home, it's unlikely you will be covered for the costs you incur for cancelling a trip or returning earlier. Policy purchase and cover - your policy needs to be purchased BEFORE you start making your travel arrangements. If you purchase a travel insurance policy AFTER making your travel arrangements, and later need to cancel your trip before your departure, you won't be covered. All excluded activities, conditions and behaviour - we extensively list everything you can't do if you want a claim to be considered for approval. It's important to understand this list and what your responsibilities are. The policy offers a range of benefits, some are superior to other insurers, but others are not. The table above details the cover. On 22 March 2019, we obtained sample quotes for two travelling couples - two 35-year-olds, and two 70-year-olds. The overseas cover we sourced quotes for four trips - 7 days in Australia, 2 weeks in Bali, 2 weeks in the USA and 4 weeks in Europe. The results are presented below. AMI Travel Insurance - $100 Excess, International Plan. No existing customer discount applied. Note: Where "Europe" isn't an option, we have selected "France" in its place. 4. Who guarantees the policy? ​AMI Travel Insurance is underwritten by Zurich Australian Insurance Limited ('Zurich'). AMI sells its policies through an organisation called Cover-More, which is owned by Zurich, and it administers the policy on behalf of Zurich. 5. Does Cover-More sell other travel insurance in New Zealand? Yes, similar cover is offered by Cover-More directly, Air New Zealand, Flight Centre. 6. Is there 24/7 support, how do I make a claim and how long does it take to process a claim? ​Emergency assistance is provided 24 hours/7 days a week by Cover-More who operate an international assistance network. Policyholders make a claim via the Cover-More website. AMI states that they 'aim to process claims as quickly as possible', and 'you will hear back within 10 working days' after you submit the claim. It will either be approved an settled, further investigated or declined. 7. What about pre-existing medical conditions? Some are automatically covered, but others are not. Our section on pre-existing conditions below explains everything in detail. 8. Can I get a discount on the policy? Yes, if you are an existing AMI customer, you automatically qualify for 10% off the total price of the policy. 9. What are the alternatives that offer a similar level of cover? Similar cover is offered by a range of travel insurers, including AA, 1Cover and Southern Cross. 10. What happens if my travel insurance claim is rejected? The policyholder not receiving important information, or if information was received, it was ambiguous or poorly worded. If you do need to complain, the FSCL will investigate and see if your claim is valid. If it is, it will decide in your favour, which usually means the insurer will pay out. However, if the travel insurer's original assessment is found to be correct, you won't receive any money. There is no cost for using the FSCL. There is a $0 excess option - this means you can claim without having to pay a fee. The benefits apply to anyone aged up to and including 84-years-of-age. The cover and claims are managed by Cover-More who provide 24/7 global support, and it is the same company behind travel insurance policies sold by Air New Zealand and Flight Centre. Relatively highest pricing for a number of sample quotes for travellers aged 35 and 70. Existing AMI customers Members receive a 10% discount on all premiums, but this does not make the prices competitive with other establishes insurers such as Southern Cross, which provides very similar policies at a lower price. Similar cover at half the price? We compared the cover and policy costs to Columbus Direct and TINZ, who both sell travel insurance online with a similar cover of core benefits (medical, personal liability, personal items, dental etc) for around 30% to 50% of the price of AMI Travel Insurance. We base this on the sample quotes for our two 35-year-old travellers visiting the USA, Bali or Europe. AMI Travel Insurance is a major player in New Zealand, and offers a level of cover consistent with that of other providers. The usual limitations and stipulations apply. Better prices are available from other providers - we believe those selecting AMI Travel Insurance are paying much more than the market average for similar cover. 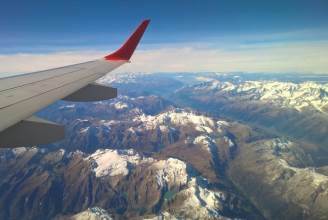 Many New Zealanders take a risk and say “why would I get travel insurance? I probably won’t use it!”. It’s the “probably” which is the issue, and if disaster strikes, being without cover can be frightening and financially ruinous. Any trip overseas exposes you to unpredictable events; no one can predict the future and even “safe” destinations expose you to unforeseen risks. We believe travel insurance is about protecting yourself from the things you don’t plan for and don’t want to pay for. Many travel insurers, including AMI Travel Insurance, have a good reputation for paying claims, but they are under no obligation to pay you if you lied or withheld information when you applied. To best protect you from a nightmare later on, give your insurer a full description of any or all of your health problems. You may have to buy additional cover for pre-existing conditions, but this protects you should something happen while you're away. AMI has an extensive section in its travel insurance policy document about pre-existing conditions. You can download their list of pre-existing medical conditions here or go to the policy directly on the AMI Travel Insurance website. All your pre-existing medical conditions are on AMI's list. If you plan to go beyond the beaten path and hire a scooter without a helmet, go off-piste skiing or do anything else considered adventurous, you probably won't be covered. If you plan to ski, snowboard or use a snowmobile, you'll need additional cover. AMI has an extensive list of included activities, which means you'll be covered if you have an accident or injury doing them. These include abseiling, archery, ballooning, bungy jumping, flying fox, horse riding, jet boating, jet skiing, kayaking, paragliding, parasailing, skydiving, snorkelling and white water rafting. activities in a professional capacity, mountaineering or rock climbing using guides, ropes, rock climbing, equipment or oxygen, scuba diving (unless qualified or diving with an instructor) and riding a motorbike or similar greater than 200cc. "(intoxication) is on a case by case basis and depends on the local rules in the country the customer is travelling in". What does this mean for day-to-day travel? It's best to behave with caution, and be responsible. If you go out and lose your bag or wallet while intoxicated, AMI Travel Insurance won't cover you. It’s important to use common sense when it comes to alcohol and travel. If you are going to go wine tasting, don’t drive your rental car until you are sober. If you have half a bottle of wine at lunch and then go skiing, you may invalidate your policy. Losses exacerbated by the health of a relative or business partner (who are not travelling) if that person has been hospitalised in the previous two years for a condition that was related to causing the claim, was living in a nursing home or had home care assistance, was on a waiting list, knew they needed surgery, had a drug or alcohol addiction or had a terminal illness. Anything relating to prohibited activities (see the full list here) and snow activities without additional cover. Bankruptcy of a travel agent, airline or any tourism service provider. Loss or theft or damage to property, or death, illness or bodily injury, if you fail to take reasonable care or put yourself in a situation where a reasonable person could foresee that loss, theft or damage to property, or a death, illness or bodily injury might happen. This can be subjective, but generally, if you behave irrationally or get into trouble and incur a loss, you won't be covered. Losses for which insurance is prohibited by law. Travel in international waters in a private sailing vessel. Private aviation and sailing - if you fly on a plane or helicopter and it's not a charter (i.e. sightseeing plane) or airline, you won't be covered. Loss or damage caused by detention, confiscation or destruction by customs or other officials or authorities, or government regulation or similar - i.e. if you bring prohibited items into a country and they are confiscated, you won't be able to claim. Losses caased directly or indirectly from an existing medical condition or new procedure you or your travelling companion has, including heart issues (AMI's policy has a full list), losses caused by a reduced immunity, known pregnancy issues, elective medical or dental treatment/surgery, a cosmetic procedure (including tattoos and piercings) during the journey. Personal issues, including suicide and self-harming, stress, travel exhaustion, STD transmission and any conduct or health effects due to alcohol or drugs. How many people can I include a policy? You can include up to 10 adults on one policy. Are children covered for free? Yes - but AMI defines 'children' as "your children or grandchildren plus one non-related child per adult policyholder, who are financially dependent on the policyholder, under the age of 21 years and not in full-time employment". Does AMI Travel Insurance cover lost, stolen or damaged luggage? Yes - up to a maximum of $25,000 and $1,500 per item, with a special $3,000 limit for electronic equipment such as laptops, cameras and video equipment. 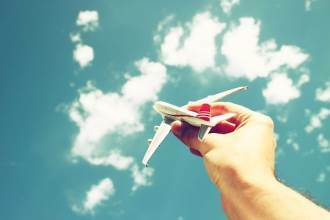 Does AMI Travel Insurance cover cancellation fees? No - this is optional cover, where you can select a benefit between $1,000 and unlimited. The higher the cover, the more the additional fee AMI charges. Can I pay to reduce my excess? Yes - AMI Travel Insurance offers excesses in $250, $100 and $0 - the lower the excess, the higher the travel insurance cost. What is the maximum length of a single trip? What additional extras are there, and how much do they cost? ​Personal items valued at above $1,500 are excluded, unless you wish to purchase cover for them. As an example, we received a quote of $50 to insure an item valued at $2,500 for four weeks in Europe. Standard excess amounts apply to any claim. Yes, cruises are covered with an AMI Travel Insurance policy. No - claims involving participation in snow skiing, snowboarding or snowmobiling are specifically excluded from AMI's cover. If you plan to hit the mountains, you will need to pay an extra fee - AMI will give you a quote online, on the phone or in person. If you do pay for this extra cover, you will only be covered if you ski on-piste and are not racing or working on a ski field. operator, accommodation provider, airline or any other travel or tourism services provider. While New Zealand doesn't see this issue very often, airlines constantly go bankrupt overseas and if you have a reservation or stuck at the airport because your airline shuts down, you won't be covered. I'm not a New Zealand resident - can I buy cover? 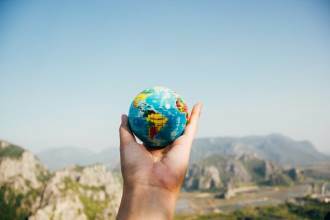 AMI assesses non-New Zealand residents wanting to purchase travel Insurance policies covering any country/destination on a 'case by case' basis. To see if you're able to be covered, AMI suggests you call their 0800 100 200 helpline. A motorbike, moped or scooter with a 200cc engine is the limit. To be insured, you must wear a helmet at all times, hold a valid New Zealand motorcycle licence or New Zealand motor vehicle driver licence, and a licence valid in the relevant country, and you cannot be racing etc. Even if you are only a passenger and not driving, to be covered you need to also be wearing a helmet and the driver must have a valid licence. If disaster strikes and you damage the motorbike, moped, scooter, property or injure another person, AMI Travel Insurance does not cover the losses. This means, for example, if your two-wheeler hits someone or something, you'll be stuck with the costs quoted by whoever you hired your two-wheeler from, and any damages payable to injured locals for your accident. Can I extend or upgrade my policy while I am travelling overseas? No - AMI specifically requires you to purchase a new policy as existing policies cannot be extended. If you need to add specialist cover, such as skiing, you will also need to purchase a new policy. AMI Travel Insurance is best purchased 'all at once' for this reason. Does AMI Travel Insurance cover rental vehicle excess? Yes - you are covered for excesses up to $10,000. In practice, most car rental companies charge an equivalent of around $5,000 maximum for an excess. How does this excess cover work? Car rental companies make a lot of money from selling insurance policies at inflated prices. AMI Travel Insurance policyholders renting cars can avoid paying for optional 'excess protection' or 'excess reduction' insurance by relying on AMI's cover. The only limitation is that if you do have an accident and the excess is charged, you will have to pay it up front, and then claim it back from AMI. This could mean an uncomfortable NZ$2,500 - $5,000 charge on your credit card while you claim on the policy. Where is AMI Travel Insurance based? AMI Travel Insurance's head office is in Auckland. What is the best way to buy an AMI Travel Insurance policy? AMI has branches and mall-stores all around New Zealand which sell travel insurance. You can also buy online and over the phone (0800 100 200).